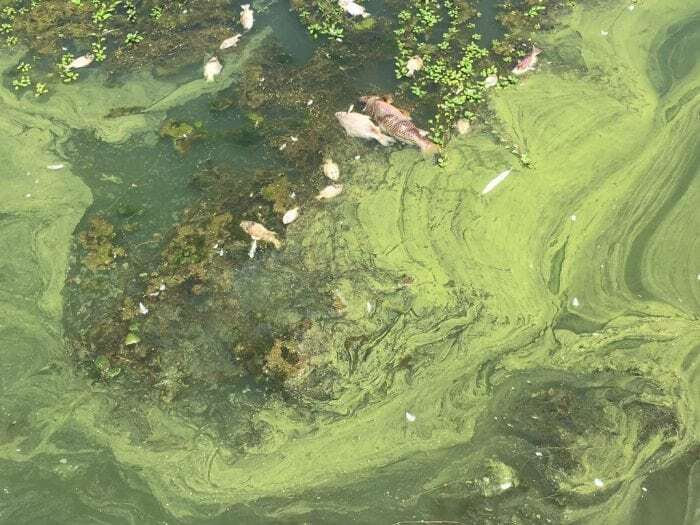 How Can We Use Fluorescence And Artificial Intelligence To Better Control Blue-Green Algal Blooms? Blue-green algae, also known as cyanobacteria, are an ancient lineage of bacteria that occupy a vast variety of habitats, from thermal springs to ice-covered Antarctic lakes. They are credited with being the first organisms to generate oxygen in the atmosphere and have therefore been critical for our own existence. Today, cyanobacteria are mostly associated with negative effects on our waterways. They are commonly found in water bodies, including lakes and reservoirs used for drinking water. Some species of cyanobacteria can produce toxins and taste and odor compounds, which make treated water aesthetically unappealing and unsafe for consumers, even after different conventional forms of treatment. Given that under certain environmental conditions (such as calm, warm water and abundant nutrients) they can rapidly grow, causing large blooms; this makes cyanobacteria monitoring and control top priorities for water utilities around the world. Scientific evidence also indicates that the magnitude and frequency of cyanobacteria blooms are likely to increase with warmer water temperatures due to climate change. Technological and computational advances have been made in water monitoring in the last few years. These advances have included the widespread deployment of optical sensors, especially fluorescence sensors, which can detect photosynthetic pigments, such as phycocyanin and chlorophyll. Chlorophyll is present in all algae, while phycocyanin is typically only found in cyanobacteria. Submersible phycocyanin and chlorophyll sensors are usually installed in conjunction with other water quality probes in a reservoir, and take readings at high frequencies (such as hourly) and resolution (such as every meter in the water column). Despite unlocking significant opportunities for effective, proactive cyanobacteria monitoring and management, it seems that technology has gone one step ahead of science. These probes suffer from a number of measurement limitations and environmental interferences that affect their accuracy and reliability. For instance, the amount of phycocyanin or chlorophyll per cell is not fixed, but changes with light exposure, nutrients, cyanobacteria species, and growth stage. In addition, fluorescence measurements are also affected by water temperature and other constituents of the water being measured. It is evident that accounting for all of these factors goes well beyond the manufacturer’s calibration, but these complicating factors are not usually explained to the user. As a result, a typical water treatment plant operator or field operator can despair about the mismatch between lab, field, and sensor results. Their expectation of a quick, accurate and cost-effective fix for the conventional costly and time-consuming manual sampling and lab analyses for cyanobacteria monitoring and control is, therefore, unrealistic. Thus, such a promising remote sensing technology may be unexploited. Our review paper shows that there is potential for science to catch up again with technology, allowing sensors to be effective for monitoring cyanobacteria. Several studies have been completed where the monitoring interferences have been quantified and the responses of different species of cyanobacteria determined. Importantly, most of the parameters affecting the readings (e.g., suspended particles, temperature, and organic matter), which are needed for a real-time compensation model, can be measured concurrently by other sensors. Therefore, sensor readings of phycocyanin and chlorophyll can be adjusted in real-time as well as for historical data. The question that arose from our study was whether it is possible to make a major breakthrough in real-time monitoring of the different species of cyanobacteria as well as the total biomass of cyanobacteria. Detecting different species is important because only certain species are harmful. Many water utilities would have large historical datasets. These data sets could be used to relate sensor readings to species identified in the lab and environmental parameters. Analyzing these data sets could identify under which water quality and environmental conditions different species are likely to bloom in a reservoir. Artificial intelligence approaches can be used to extract correlations out of this “big data.” In addition, because a species of cyanobacteria emits a unique fluorescence signature which is detected by sensors at specific wavelengths, it may be possible to also use real-time sensors data to refine the prediction. Modeling approaches, such as Bayesian modeling, may ultimately be able to take chlorophyll and phycocyanin sensor readings and use other environmental parameters to provide a real-time estimation of the cyanobacteria species present. This is not a straightforward modeling exercise. Environmental systems, especially involving living organisms, are often unpredictable, and we already know that there are certain discrepancies between lab and field responses of organisms. But cyanobacteria blooms are often mono-specific or comprise only two or three species, making the task of describing species present somewhat easier. We have a unique opportunity to take technological advances from sensors, use the expertise of scientists, engineers, and modelers, and provide a practical tool for lake managers to better protect human health and prevent closures of water supplies when blooms occur. These findings are described in the article entitled Fluorescence probes for real-time remote cyanobacteria monitoring: A review of challenges and opportunities, recently published in the journal Water Research. This work was conducted by Edoardo Bertone, Michele A. Burford, and David P. Hamilton from Griffith University. Michele Astrid Burford is the Dean of Research Infrastructure at Griffith University · Office of the deputy Vice Chancellor. Dr. Edoardo Bertone is a researcher with a civil engineering background, and a current focus on data-driven modelling, Bayesian Network and System Dynamics modelling applied to the water resources management, water treatment optimization, water-energy nexus, sustainable cities, environmental health and climate change adaptation fields. David Philip Hamilton is the Deputy Director in the Australian Rivers Institute, Griffith University, Brisbane. His research interests are in lake water quality modelling, cyanobacteria harmful algal blooms and sensors for measuring lake parameters.